Edison State President Doreen Larson cuts the ribbon to the campus at Eaton. 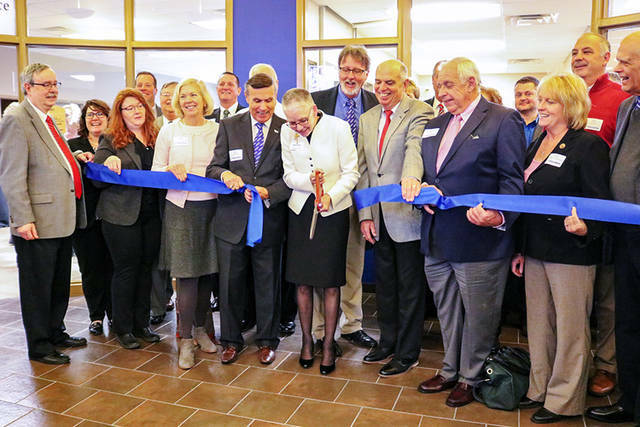 EATON – More than 100 supporters were in attendance to witness the ribbon-cutting ceremony at Edison State Community College’s campus at Eaton Wednesday afternoon. Those in attendance included business partners, community members, elected officials, future students and Edison State alumni, faculty and staff. Edison State President Doreen Larson began her speech by welcoming and thanking supporters in attendance. Larson then took a moment to outline the similar drive that has led Edison State Community College and the Preble County Youth Foundation to success. “In 1973, a group of leaders from the Upper Miami Valley refused to take no for an answer when they failed to get a levy-based community college,” Larson said. “That group went back to the drawing board, and they established Edison State as the first state community college in Ohio. “Likewise, the leaders here in Preble County and the Preble County Youth Foundation, in particular, refused to take no for an answer when they saw a critical need for a community college in this region. Edison State Board of Trustee Chairman Tom Milligan echoed Larson’s sentiments, expressing the importance of this partnership. “I feel that this new partnership will become an important extension of the Edison State mission, to provide the learning opportunities, support system and commitment that enable students to complete their educational goal and realize their dreams,” Milligan said. Currently offering general education courses, the campus at Eaton presents the opportunity for credit and non-credit programs, including College Credit Plus coursework; degree and certificate courses in agriculture, agribusiness and ag education transfer pathways to both in- and out-of-state four-year institutions; expanded articulation agreements with Miami Valley Career Technology Center and support to regional businesses with response workforce training and apprenticeship opportunities. “Edison State’s success will be our success. The Preble County Youth Foundation intends to improve the lives of the community of the families and children in Preble County,” PCYF President Bill Dues said. “Children are the message that we send to a time we will never see, so take our children and students, educate them and send them into the future of Preble County and this wonderful state, and you’ll be one of the best partners we have,” Dues said. Rounding out the ceremonies, newly elected State Sen. Steve Huffman spoke of his experience taking classes at Edison State between his sophomore and junior years of college. The Edison State campus at Eaton is located at 450 Washington Jackson Road neighboring a YMCA and a Kettering Healthcare and MedFlight facility. The campus at Eaton will make the college’s fourth campus location. Other locations include the main Campus at Piqua, the Campus at Greenville and the Campus at Troy, which is projected to open in fall of 2019. Students services at the campus at Eaton will mirror those found at all Edison State campuses. For more information, call a resource specialist at 937-778-8600 or visit www.edisonohio.edu.